‘Fiona Hall: Uneasy Seasons is a captivating and imaginative response to the environment and changing seasons through the lens of one of Australia’s most brilliant artistic minds.' Tony Ellwood, NGV, Director. 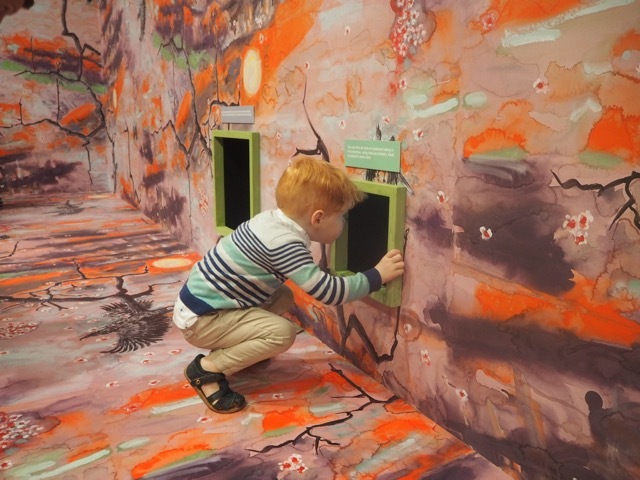 Kate and her little ones attended the launch of Fiona Hall: Uneasy Seasons at the NGV International recently and loved exploring the space and participating in the craft activities. The exhibition features two large scale tree houses - one for young visitors and the other for teenagers. Visitors are invited to explore the two spaces and participate in art making activities and how they feel about the natural world. The first space WHO LIVES HERE? offers a brightly lit tree house nestled amongst warm hued wallpaper signalling new beginnings. Taking cues from the springtime atmosphere, children are invited to make creatures using a range of collage materials that reference different animal and habitat textures. Children can choose to make a small creature, such as a tiny insect, spider, earthworm, snail or crab; or perhaps a bigger creature, such as a fish, frog, lizard, bird or furry animal. Over the exhibition period numerous species, brought to life by children, will make this space their new home. Visitors are then invited to display their artwork, populating the tree-house with an array of colourful and imaginative creatures. The second space SEND A MESSAGE however was created specifically for teenagers and presents a darkened tree-house in a night-time environment, reflecting a wintery atmosphere. In this shadowy space, encased in Fiona Hall’s hand painted wallpaper depicting imagery of skulls and blood red blossoms, teens are invited to create their very own paper ‘emoji’ symbol responding to an environmental, social, or political issue. Teens are encouraged to decorate the tree-house roof with their hand-crafted emoji sending their message to other visitors. Fiona Hall: Uneasy Seasons is on at the NGV International until Sunday 8th October at ground level and is completely FREE. For more information, head to the NGV's dedicate website.